Kazem* is an Iranian refugee who has been held on Nauru for five years and three months. “I left Iran because of my religion. I converted from Islam to Christianity, and in my country, if you do this, the first thing that happens is torture and prison. At the highest level, you are facing death. It was very difficult, but my wife and I decided to flee. 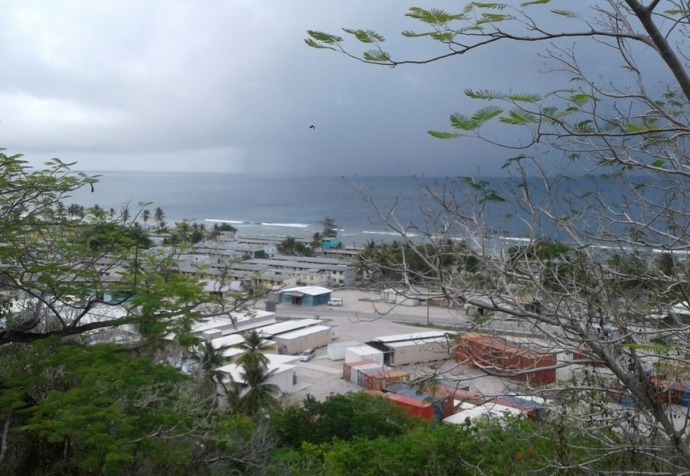 For the first year on Nauru, we were in a tent. It was really, really hard. In 2014 we came out to live in the community and we became refugees. We thought that everything was going to be normal and everything was going to be good. But after a while, we found out that there is no difference between the tent and the community because you’re just transferred from a small prison to the big prison that’s surrounded by ocean. A child detained on Nauru illustrates their despair during a mental health session with an MSF doctor. The main thing that has caused us to suffer, too much, is about the future. We were recognised as refugees in 2014 but we still don’t know about our future. We applied to be settled in the US, and we recently got the negative results. Homeland security rejected me and my wife. That decision affected us so, so much. I still don’t know how long it will take to get out of here. This is really hard. Right now my wife is suffering from deep depression. She was treated by MSF very well. As soon as MSF was gone, my wife’s situation is getting worse by day. I am trying to get an appointment for her with the IHMS [International Health and Medical Services] mental health team, but it takes a long time. Today is the 24th day that she couldn’t eat, she couldn’t sleep, she couldn’t even drink and she didn’t get out of bed. All the time she just lay down. "My life looks like a boat with a big hole in it, and I can see my life going down and sinking into the oceans." I have tried to be strong and healthy to support my family, to support my wife, to support myself. But right now, I’m really, really tired. My life looks like a boat with a big hole in it, and I can see my life going down and sinking into the oceans. Some people from the Australian government say ‘we’re going to evacuate all the kids before Christmas’. Then another one says, ‘no, we never said that’. There is no deadline, there is nothing, no rules – they are just playing. People here are happy to see children evacuated from Nauru, but at the same time they are worried about themselves. They say, ‘what will happen to us? We don’t have kids, maybe we will have to stay here for a long time. Maybe the Australian government is going to play with us’. You know, maybe you in Australia or other countries follow the news in Nauru every day, but it is not affecting your life. When we follow the news, we are looking for our future! Today we might get hope from the news but then tomorrow we might find that they will destroy us more than yesterday.